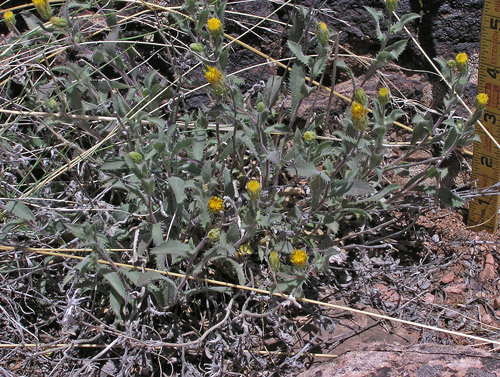 Thomas Nuttall collected the first specimen of Machaeranthera grindelioides in Oregon on the Wyeth Expedition of 1834-1837. 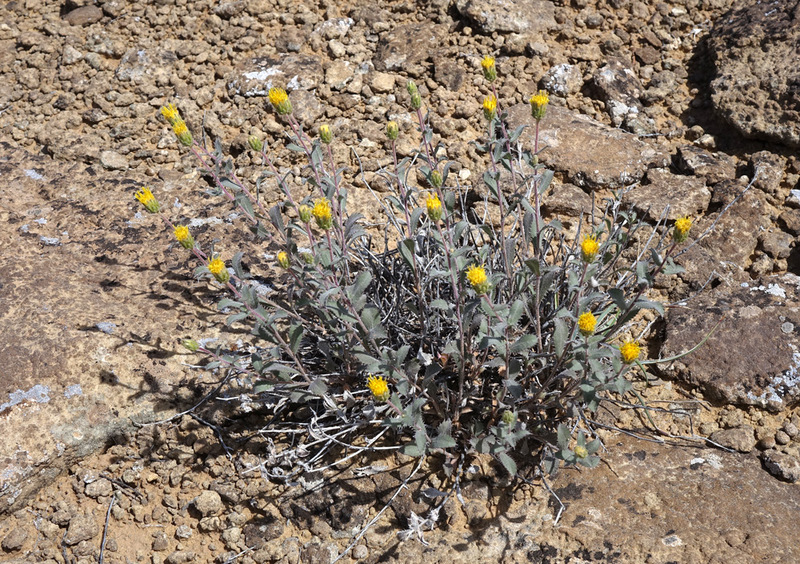 Nuttall named the plant Eriocarpum grindelioides in 1841, and the plant went through several name changes over the next century until Lloyd Shinners placed it in the Machaeranthera genus as M. grindelioides in 1950. 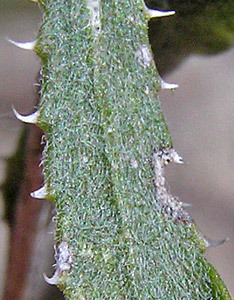 In 2003 Morgan and Hartman moved it to its present genus, Xanthisma. Semi-desert. Openings, rimrock sands and gravels. Spring. Above: Lower Cross Canyon, Utah, May 17, 2015. 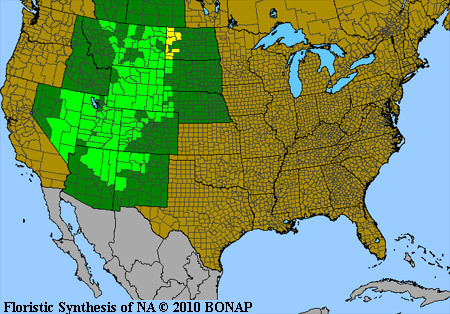 Left: Canyons of the Ancients National Monument, May 15, 2006. Xanthisma grindelioides probably attracts more attention with its needle-toothed leaves (see next photographs) than with its small, ray-less flowers (see last photograph). 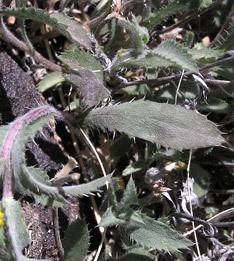 The plant thrives in hot, dry, open areas where it grows in small clumps with last year's dead growth forming a gray skirt around it. "Machaer" is Greek for "sword" and "anthera" is Greek for "anthers" from "anthos", "flower". "Machaeranthera" thus refers to the sword shape of the anther tips. Xanthisma is from the Greek "xanth" meaning "yellow". Canyons of the Ancients National Monument, May 15, 2006 and October 19, 2007. Canyons of the Ancients National Monument, May 15, 2006 and May 17, 2009. The top photograph at left shows a flower head noticeably fresher than the flower head in the bottom photograph. Notice that the phyllaries of both have tiny glistening dots, which are glandular hairs that appear as bright spots on the top flower head, but are best observed on the bottom flower head along the sunlit edge where they actually appear to be sand particles. They are sand, for the glandular hairs trap sand -- and bugs and various debris. 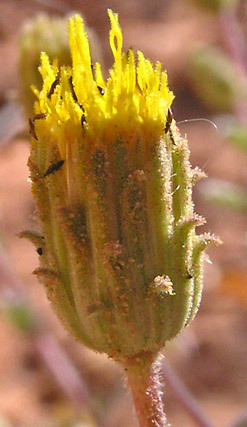 The top flower head is so fresh that nothing has yet stuck to the glandular hairs. 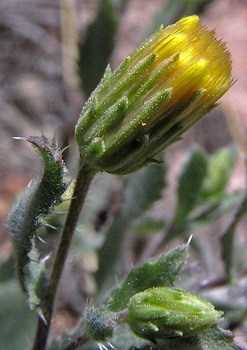 Flattened, long, yellow styles protrude from the top of the flower head. Canyons of the Ancients National Monument, January 5, 2012. 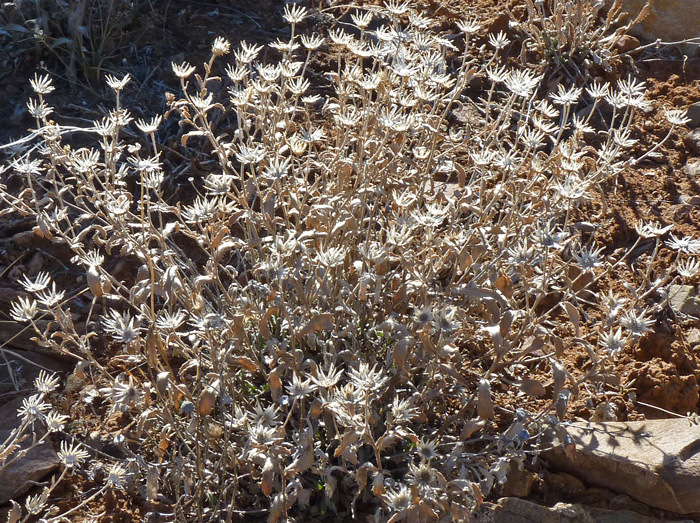 A low winter sun illuminates Xanthisma grindelioides.